Happy New Year, peeps! I hope you all had a lovely Christmas break and have come back refreshed. I have to say, I was quite delighted to get back to the routine… and then I got back to the routine and decided it wasn’t that great after all. Hey ho. 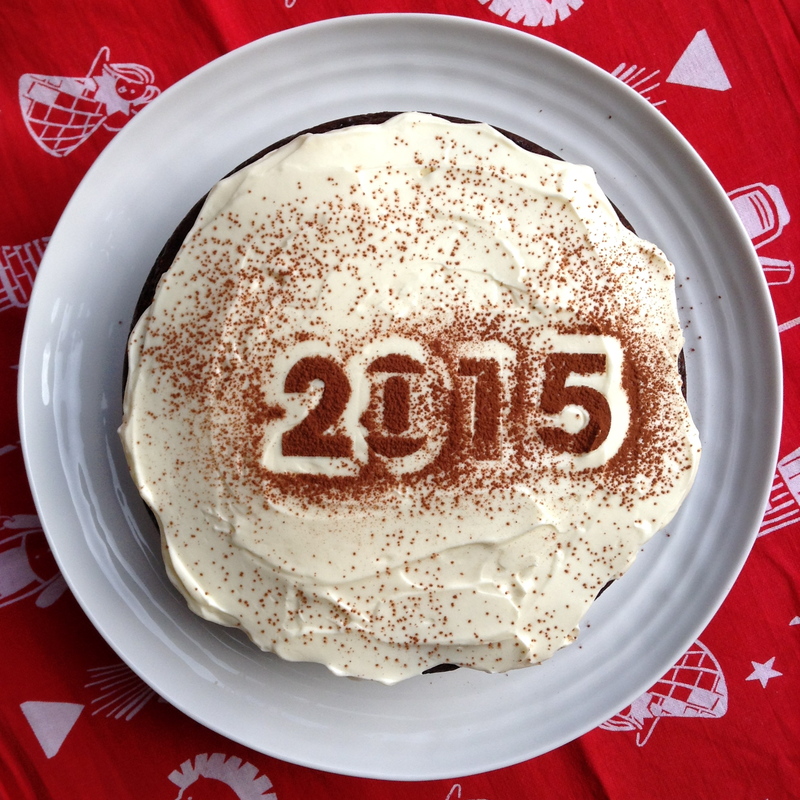 So what does 2015 have in store? Most excitingly a trip to New Zealand is in the pipeline this December. Yup, Christmas 2015 will be spent on the South Island with Husband’s brother and his family, which is something to look forward to, and a motivating factor in my quest to get fit and healthy. So, time permitting, I am getting back into running and have already been several times during the last couple of weeks. Of course, it’s fitting it in around the family and work that’s the issue, especially given that it’s dark in the morning and the evening, which I don’t find very motivating. But I have also built more walking into my daily commute, which is good for my health, and has the added benefit of being cheaper, too. I have been listening to the (very gripping) Serial podcast as I walk, which helps pass the time. We’ve been making lots of delicious smoothies and healthy breakfasts, including overnight oats, here at OH HQ, too (more to come on this soon! ), and both Husband and I have been doing loads of cooking from various cookbooks – new and old, which has been lovely. I am LOVING our new KitchenAid, and so Littlest and I spent the afternoon making a chocolate cake because, well, just because really! She loved cracking the eggs, sifting the flour (although she did get bored half way through) and stirring and mixing. A great way to pass a winter’s afternoon with a little one. This recipe is slightly adapted from The Guardian’s ‘Guide to Baking’, which was given away with the newspaper way back in 2007 and this chocolate cake is simply incredible. The icing is from Nigella’s Feast, and is the icing she uses on her Chocolate Guinness Cake. Nothing healthy here, I’m afraid, it’s pure indulgence! Heat the oven to 180C (160C Fan) and line the base of a 20cm diameter, 9cm deep round cake tin (or the closest you have to this) with baking parchment. Melt the chocolate into the boiling milk and allow to stand and cool for 15 minutes or so. Meanwhile, weigh and sift all of the dry ingredients into a large mixing bowl (I used the KitchenAid bowl). Whisk together the eggs, oil, golden syrup and vanilla and then beat into your milky-chocolate mix from step 2. Whisk this liquid into your dry ingredients for 30 seconds (this is where I used the KitchenAid) until smooth, and pour the batter into the tin. Bake for approx. 50 minutes, or until a skewer inserted comes out clean. Allow to cool before topping with the below. 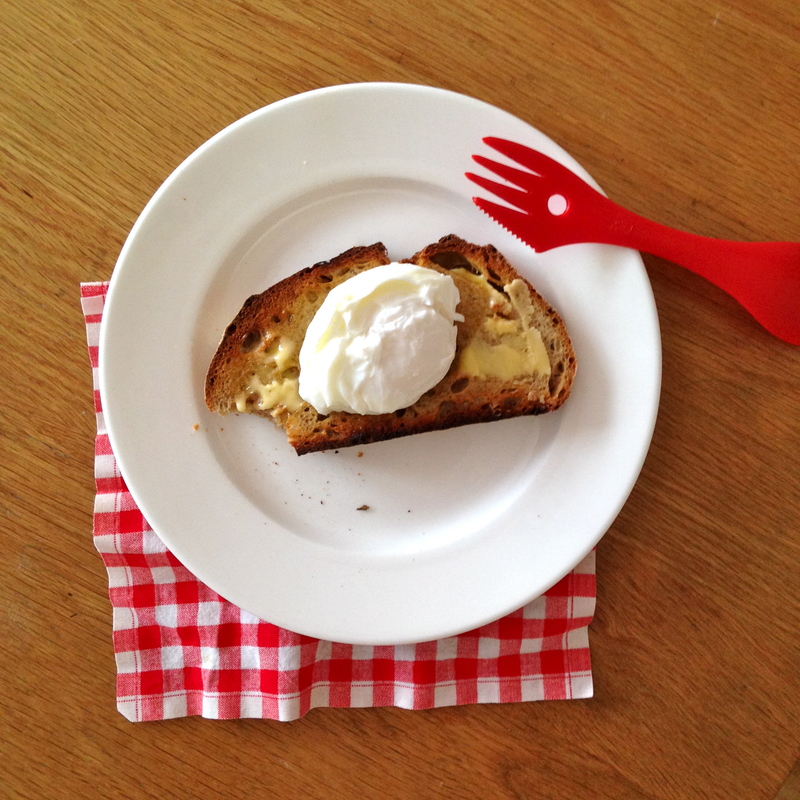 Lightly whip the cream cheese until smooth – I used the KitchenAid to do this (because I love it). Sieve over the icing sugar, and then beat both together. Add the cream and beat again until it makes a spreadable consistency. Spread over the top of your cake and sprinkle with cocoa powder from a fine-mesh sieve. 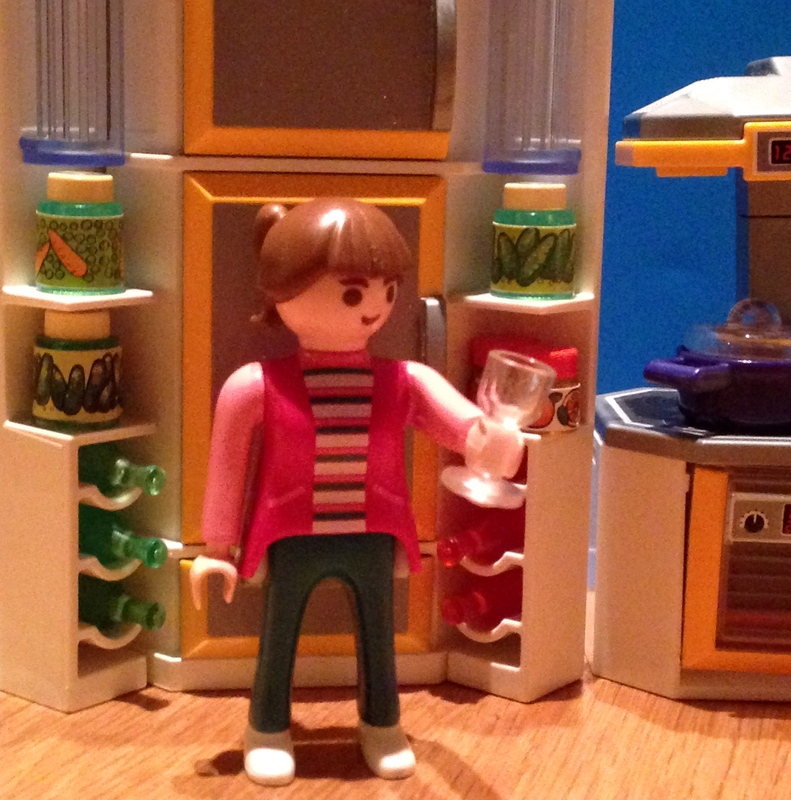 Let’s raise a glass to having a well-stocked kitchen cupboard! Lifestyle blog Tombola Times has set out to reveal the nation’s Top 10 Must-Have Store Cupboard Items and got in touch asking if I’d share my most essential items with them. Not an easy task – there are so many ‘must-have’ things in my cupboard, that choosing just 10 was tricky! 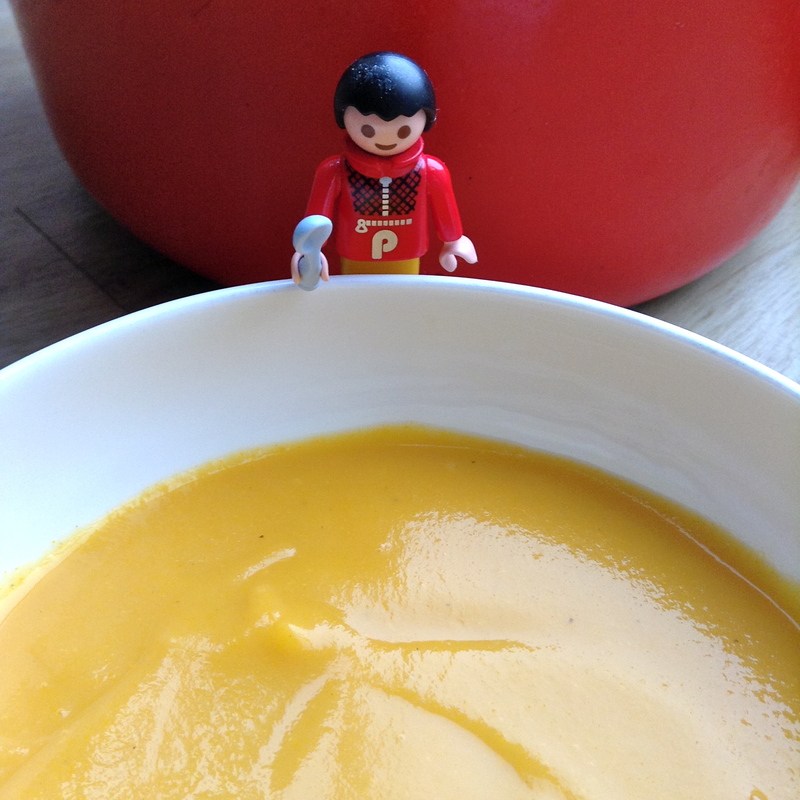 Here are my Top 10 Hero Kitchen Cupboard essentials, complete with notes on each item. NB They are in no particular order; all are essential! Versatile, cheap, nutritious – if you’ve got eggs and some salt & pepper, you’ve always got a quick and easy meal. Poached, scrambled, boiled, fried or used to make a quick carbonara sauce for pasta – eggs are the ultimate convenience food. Keep on hand for when you have leftover roast chicken or vegetables and make a delicious creamy risotto with stock and Parmesan grated in. Kids love it. A must for every cupboard – whether you’re whipping up a Bolognese, a casserole, or a simple pasta sauce, tinned tomatoes are packed with flavour. My favourite brand is Napolina. Where would we be without it? Many’s the time I’ve thought ‘what the heck are we going to have for dinner?’, spotted the pasta, eyed up the contents of the fridge, and created supper out of practically nothing. Best brand? De Cecco, without a doubt. We are fans of Sainsbury’s albacore tuna, which tastes about a hundred times nicer than bog-standard tuna. A great lean protein source, it has a lovely flavour, a good firm texture and is delicious in salads, pasta dishes or with mayo in sandwiches. I buy Kikkoman’s soy sauce; always have, always will. It’s fantastic in stir-fries, adds bite to salad dressings and makes a great marinade for chicken, fish or steaks. I tend to use extra-virgin olive oil in dressings and to drizzle on food, and a lighter olive oil for cooking. High in monounsaturated fat it’s a healthier choice for the family. The best one I’ve discovered is Waitrose’s organic maple syrup – it tastes simply divine. Drizzle maple syrup one-handed on to pancakes at the weekend, add to cakes and muffins when baking, or pour onto plain yogurt and dot with fresh berries. Yum. My favourite is Whole Earth’s Crunchy Peanut Butter as it contains just peanuts, oil and salt. It’s brilliant on its own on toast or rice cakes, with bananas and maple syrup on pancakes, or added to stir-fries for a satay-style kick. I don’t think I could cook without fresh garlic; along with salt, pepper, and my array of herbs and spices, it’s what gives my savoury dishes depth and flavour. Love it. Of course, if I could pick 11, red wine would definitely be on there! 😉 What do you think of my list? Would yours be different? Take part in the survey here and share your store cupboard essentials. I recently had the pleasure of spending a day with professional food stylist Rosie Reynolds, who gave me some expert food styling advice for food blog photos. Rosie and I met through work, and she was so enthusiastic about my blog, she came to see me at One-Handed HQ for a Halloween-themed baking, decorating and photo session. 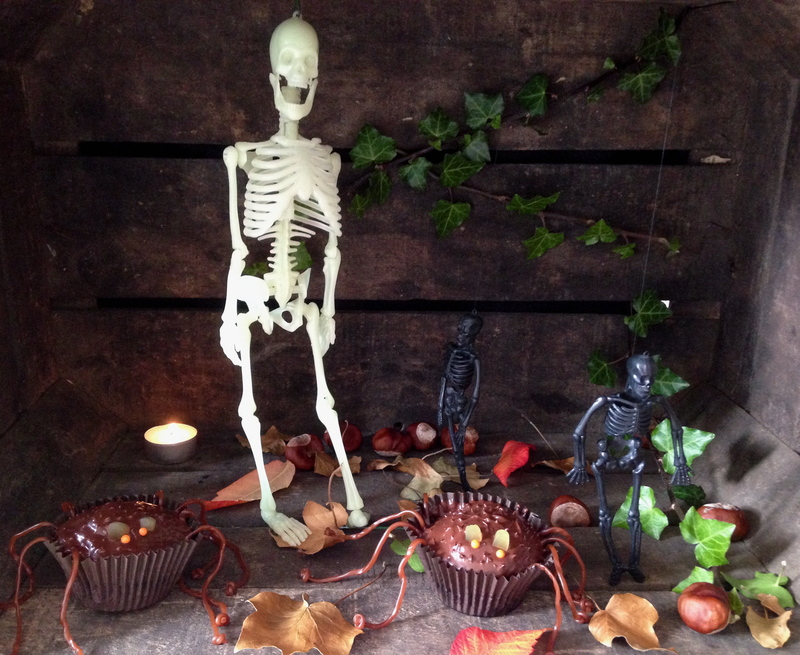 We baked delicious chocolate cupcakes, which we decorated using jelly snakes to make Snake Cupcakes, and with chocolate icing and cola laces to make Spider Cupcakes, which we then had great fun setting up in a spooky Halloween tableau (above), complete with skeletons dangling down, all lit by candlelight. In the words of Miranda: such fun! Rosie has a great eye, and one of the best tips I learnt from her was to take the photo and then look at it really carefully on-screen before deciding what to add in or what to remove to get the best possible shot. Make the change, then take another photo, and compare the two. Usually the secret is taking something away to simplify things and let the food take centre stage. 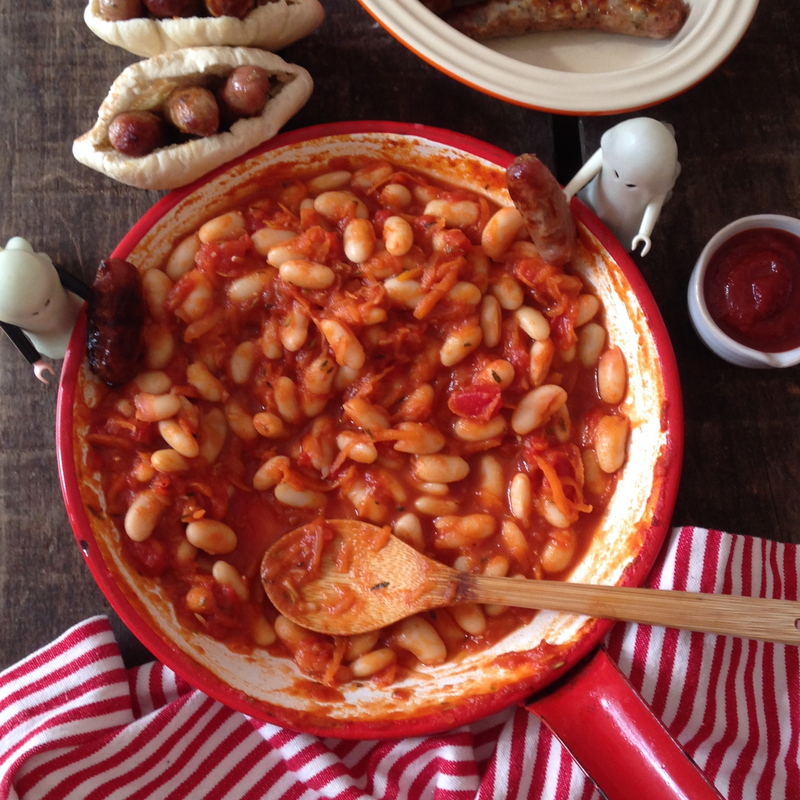 Another great tip is to try to keep the food and the styling as natural as possible – if you’re serving a casserole, for instance, don’t be afraid to dig into the food and swirl it around with the serving spoon, so it looks accessible and yummy. For cakes and puddings, a few crumbs scattered around make it look even more delicious and homemade. For best results, shoot in natural daylight (these photos were all taken on my iPhone) and think about the background you are presenting the food on – again, natural surfaces are great for such purposes. Wood, tile and slate are good; have you got an old wooden trunk, or some tiles left over from a building project? Even an old door with peeling paint can be great for overhead shots. Sometimes the most unexpected things can work really well. Take a good look through your cookbooks or BBC Good Food and take inspiration from what they use. Pinterest is useful for ideas, too. 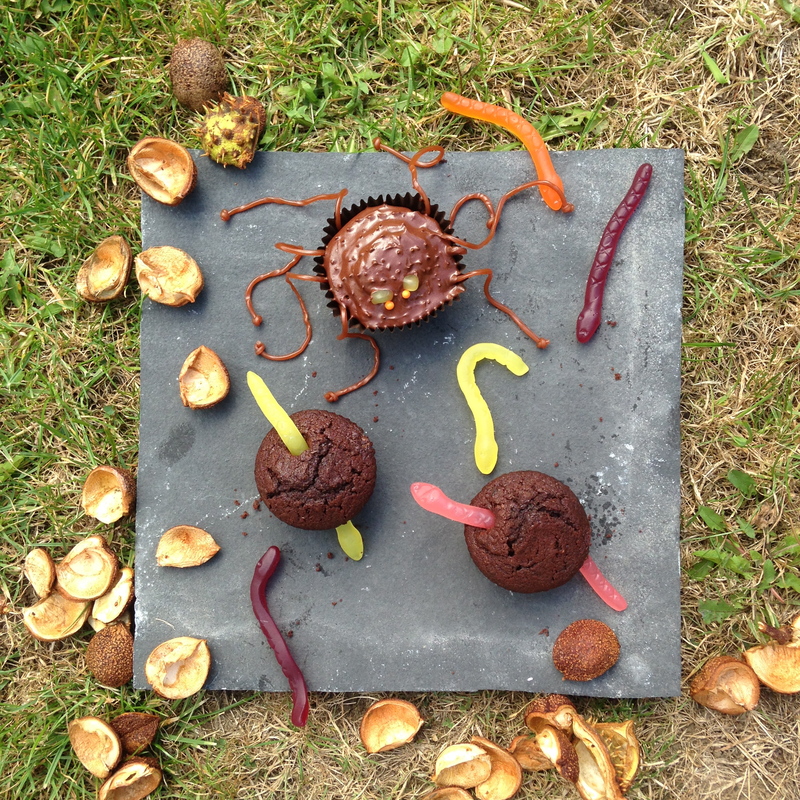 We had a great time styling these shots (and eating jelly snakes). I picked up some really useful tips for future posts and I hope you like them, and enjoy the cakes. Of course, they’re very sweet, so a bit of a treat for little ones. I presented them whole to the children and then cut each cake in half as I thought a whole one would be too much for one child. (I was right.) 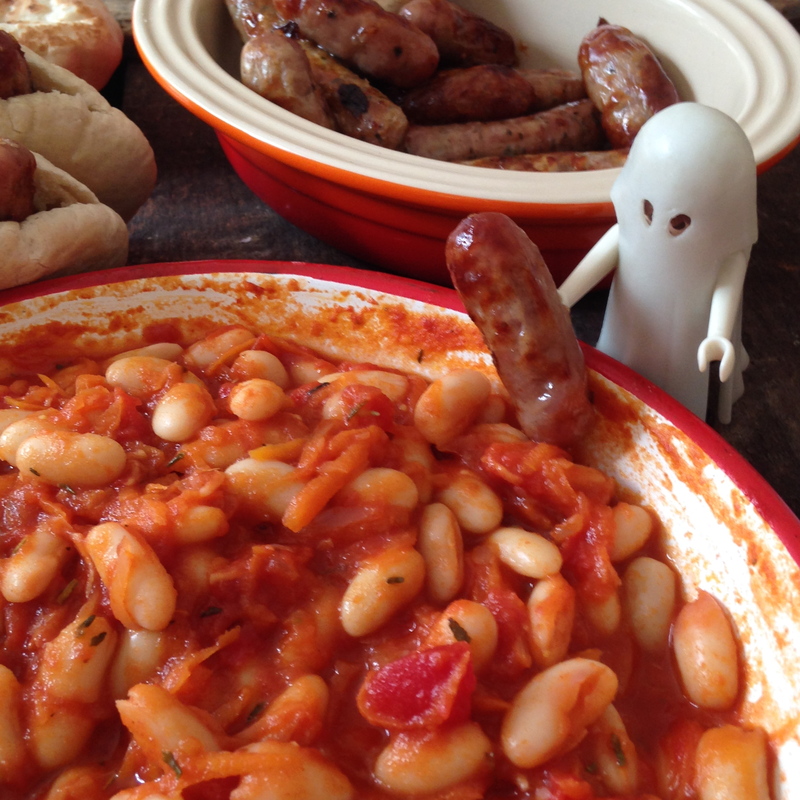 They absolutely loved them – a real Halloween hit! 1. Preheat oven to 180C/160C Fan/Gas 4. Line a muffin tray with 10 paper cases, set aside. 2. Sift the cocoa into a bowl. Stir in the water to make a smooth paste. Tip in the rest of the ingredients and beat with a wooden spoon until smooth. 3. Use two dessert spoons to evenly fill your cake cases – be careful not to overfill. 4. Bake for 18-20 minutes, or until your cakes are risen and a skewer inserted into the middle of a cake comes out clean. Remove from the oven and allow to cool completely on a wire rack. Cream the butter, cocoa and yogurt together until smooth. Gradually add the sifted icing sugar, beat after each addition until smooth. It might be a bit dry, but if you let the mix relax then keep beating it should come together, if not, add a splash of hot water to create a smooth icing. Divide the icing between your cakes, spread over the surface with the back of a spoon. Decorate yourself, or get bigger kids to do their own – depending on how good you are at coping with MESS! Snake Cupcakes: We decided not to ice these, but of course you can if you want to. Simply cut your jelly snake in half, and make a little hole in the side of your cake, using your fingers. 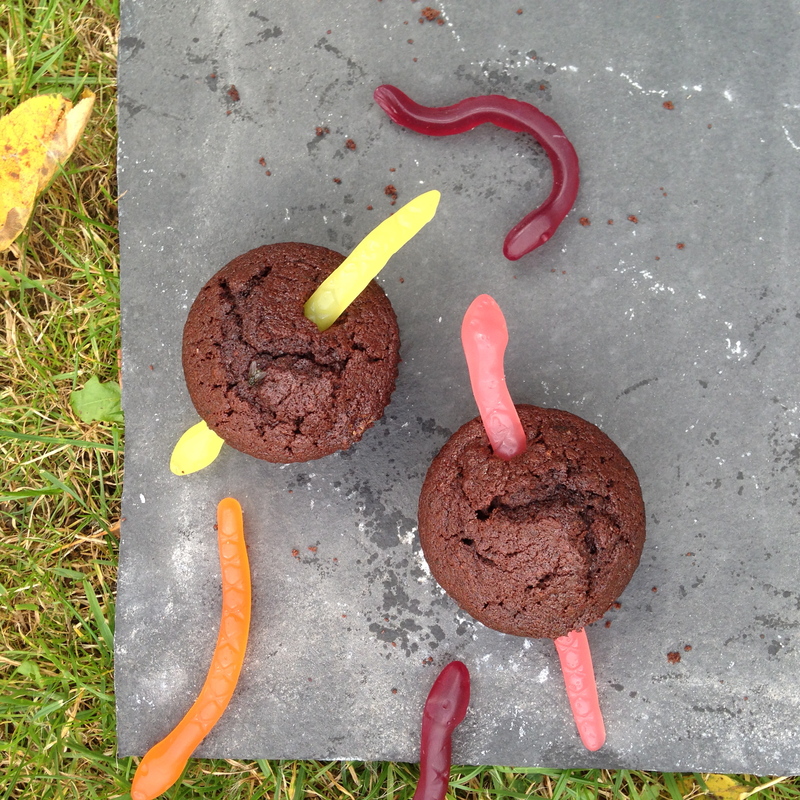 Make another little hole on the opposite side of the cupcake to enable your snake to ‘slither’ through the cake – stick the head in one hole and the tail in the other. It’s that easy. Spider Cupcakes: Spread the top of the cake with icing and use a cocktail stick to prick the icing and make little bumps. Use little sugar balls for the eyes and cut-up bits of jelly snake for eyebrows. To make the dangly legs, cut cola laces in half and tie a little knot at the end for a foot. Use the cocktail stick to make a little hole for each leg. Every now and then I am lucky enough to interview a mum who has some interesting insights into how she feeds her children. To date I’ve interviewed Great British Bake Off winner, Jo Wheatley, Health Editor of Red magazine, Brigid Moss and my friend – and baby-led weaning fan – Camilla. Last week I was delighted to get the chance to talk to local south-east London mum and entrepreneur, Meriel Kehoe (pictured, right). Before launching Claudi & Fin, Meriel worked as a TV Producer and Director on programmes like Location, Location, Location, Gardener’s World, Gok’s Fashion Fix, Kirstie’s Homemade Home and Yottam Ottolenghi’s Meditteranean Island Feast. 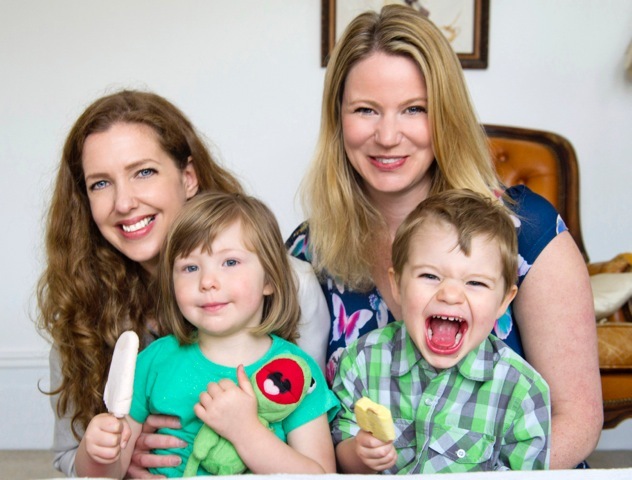 Meriel lives in south-east London with her husband and son, Fin, who is 3½. Read on for some great insights into how she encourages her son to eat healthily and tips on how to launch a successful children’s food brand! Q Meriel, you’re a busy mum who’s recently launched a business from home. How do you juggle work and family time? Badly! I’d love to say that I move seamlessly from one role to the other but the reality is somewhat different. There are definite plusses to running your own business, and because both Lucy and I work from home, we are flexible and can be around for the children if and when we are needed. However, the flipside is because there are only two of us doing pretty much everything, work inevitably creeps into leisure or family time, try as we might to stop it! Q What do you like to cook at home? Do you and your partner share the cooking? I love cooking and am fortunate because my husband loves it as well. I don’t bake much, but I love cooking for other people and for the family – healthy, hearty food – anything from 80s classics like Coq au Vin, through to Stuffed Aubergines and Roasted Garlic Tart (trust me, the latter is amazing – thanks Yottam Ottolenghi). Q What is your go-to quick meal for the family? Omelette with tomato, onion and ham. Fin loves it! Q What snacks and treats does Fin enjoy? He loves yoghurt, (frozen or otherwise – he’s literally been weaned on the stuff) fruit and – given half the chance – any sort of chocolate. He’s not allowed it very often, so when he gets his hands on some, he goes wild. Q How do you encourage Fin to eat healthily? I try to lead by example. I firmly believe that as in all areas of life, children mimic what they see around them, so I try to make sure we eat healthily around him. I also talk to him about making healthy choices by telling him which foods will help him grow big and strong. Q Do you worry about the amount of sugar in kids’ food? Yes. You only need to switch on the TV or pick up a newspaper to realize that childhood obesity is a huge issue, with sugar being the biggest culprit. Because of this, we tried to make our lollies using no sugar but I’m afraid to say, they really didn’t taste good. Instead, we’ve kept sugar to an absolute minimum – less in fact than 79% of the best-selling chilled yoghurts and lollies on the market. 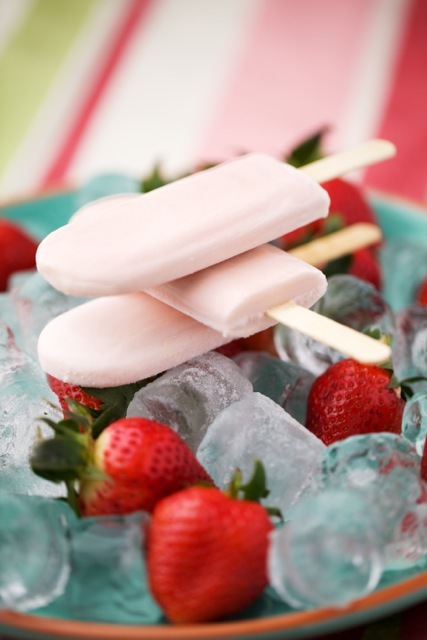 Q How did you come up with the idea for your frozen yogurt lollies? Lucy came up with the idea when she was weaning her daughter, Claudia. It was the height of summer and she wanted to give her a healthy ice-lolly but quickly discovered there was nothing that fitted the bill. She started making yoghurt lollies at home and thought ‘if Claudia likes them, maybe other children will too…’ She told me about her idea and I loved it. From that point on, every spare moment we had was spent mixing and whizzing up ingredients, trying to come up with an amazing recipe. Our chief taste testers were our children, Claudi & Fin, who went crazy for the flavours we dreamt up, which is why we named our company after them. Q Tell me about your products and future plans. Our lollies are the UK’s first Greek-style frozen yoghurt pops for children. Packed with creamy yoghurt, full-fat milk and tons of fruit, our low-sugar, low-calorie lollies are a treat for tiny taste buds (and parents love them too!). We’ve enriched them with Vitamin D, because an astonishing one in four British children is now deficient and doctors are recommending supplementation for all under 5’s. 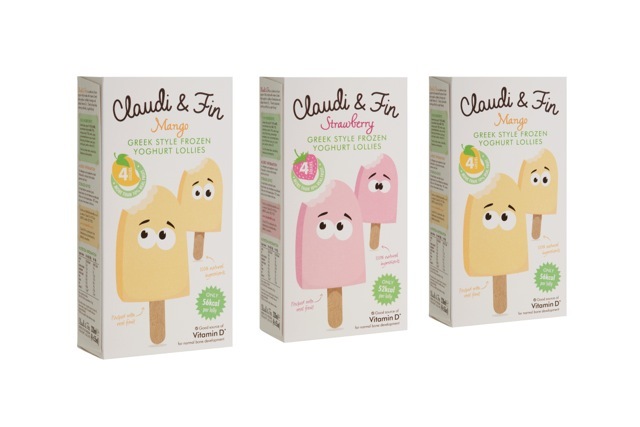 Claudi & Fin lollies are currently stocked in 320 Sainsburys stores nationwide and available in two flavours; strawberry and mango. We’re working on new flavours and looking into all sorts of new ideas. I can’t say anything too specific just yet, but watch this space! Q Do you have any advice for any entrepreneurial mums (and dads) out there? If you have a great idea, take the leap and give it a go, but make sure you do your research first! It’s not enough if your Aunty Betty thinks you’ve got a great product, you’ll need test it out on your potential consumers too. You can back this up by accessing market research data. We found out that reports from big research companies like Mintel are available for free at the Business Centre in the British Library in London, and these stats and insights proved invaluable when we were preparing for pitches to supermarket buyers. Q What inspires you and keeps you motivated? It might sound like a cliché but I want to give Fin the best life I possibly can and that keeps me motivated. I’m also excited by the challenges of running a business and the fact that I’m learning new skills every day in a fast-paced environment. Q What’s your vision for the Claudi & Fin in the future? Lucy and I want to build a brand that parents can trust. We don’t put anything in our lollies that we wouldn’t give to our own children. We take a lot of time and care thinking about what goes into our products, and we want parents to feel confident that they can trust we will deliver for them on taste, and on nutritional benefits.